FAQs — Embrace. Embody. Empower. 1. What is the time commitment of this training? Please see the “Schedule” tab for more details. 2. What can I expect to learn from this training? Please visit our “Intentions & Objectives” tab for more information. 3. I’m on a budget and this is a financial investment. Do you offer payment plans? Without a doubt! Please see our “Payment Options” tab to see payment plan options. 4. I have a prior commitment that conflicts with the schedule! Do I need to attend the entire training, in order to receive my YTT certification? We understand that life happens and we hope to honor your commitments, as you do our training. You are able/allowed to miss one week of training, and still make up the hours through alternative means (*to discuss if admitted). While we don’t want you to miss a moment, we will work with you to make this an accessible experience. 5. If I don’t plan to be a yoga teacher, why would I take a yoga teacher training? This training is so much more than simply learning to teach a yoga class to different bodies. This training is also about learning how to embrace ourselves more fully through personal development, community connection, and experiential experimentation. It helps us to dive deeper into our personal yoga practice and learn the ancient wisdom of its philosophy, history and depth. You will move your bodies in new ways, learn how to confidently present and inspire others, make lifelong friendships, and become a brighter version of yourself. This training also caters towards teachers, caretakers, & wellness providers who want to have yoga as a back pocket tool for holistic approaches to body, mind and spirit health. 6. Is it important for a Yoga Teacher Training to be “Yoga Alliance Certified”? We think so! Yoga Alliance is the endorser and overseer of legitimacy in yoga teacher training programs. YA creates specific criteria for structure, safety, professionalism and content. Our 200hr “Embrace, Embody, Empower” YTT is under review with Yoga Alliance, and we’re working to meet their standards. Our training is committed to matching this criteria to deliver the best training possible, and procure the best teachers possible. 7. What if I’m new to yoga? Am I capable of “keeping up” in this training? This wouldn’t be a teacher training for every type of body, if we didn’t make it available, inclusive and accessible to all; no matter their level of experience with yoga or physical capabilities. Please know that a beginner student or someone with specialized circumstances is just as eagerly welcomed to take this training as everyone else. People with different experiences provide fresh perspectives and we look forward to learning from one another. During this training, there will be many opportunities to familiarize ourselves with the experience and emBODYment of yoga, no matter your background with the practice. 8. I’ve already completed a 200hr YTT. Would taking this training be redundant? This is an unbelievably unique training because it focuses on making yoga available to bodies that we don’t see as often in the traditional class setting. Even if you have taken a teacher training in the past, often the specialized populations (pre-natal, plus-size, chair yoga, etc.) are glazed over too quickly in the average curriculum . This training slows down so that we get to know diverse body types and the unique ways we may modify, adjust and adapt yoga to teach in an all encompassing manner. We also have incredible keynote speakers, adaptive observation hours, SEVA opportunities and connection with fellow trainees who will shed light on their unique experience with yoga. And since you know the drill: you yourself will be transforming BIG time! We will learn to embrace our own bodies and empower others to do so along the way as well. 9. How do I prepare for this training? Start by applying, registering and making your $500 non-refundable (yet transferable) deposit. You will be notified of our admissions decision through a personal email. If admitted, you will be provided with next steps to complete enrollment as well as a full list of what to bring. If not admitted to the teacher training, your deposit will be refunded, and we will share what we would love you to prepare in order to be ready for the next round. Most importantly: We ask that you plan to arrive with an open mind and heart. 10. Will I be able to teach yoga after completing this training? YES! Not only will you be able to successfully teach a yoga class, but you will also be able to mindfully read your student’s bodies and abilities, and adapt your teaching to meet the needs of each student. We want to develop teachers that are able to meet students where they are in each moment. 11. Can I meet the teachers and get more information before I sign up? Yes. 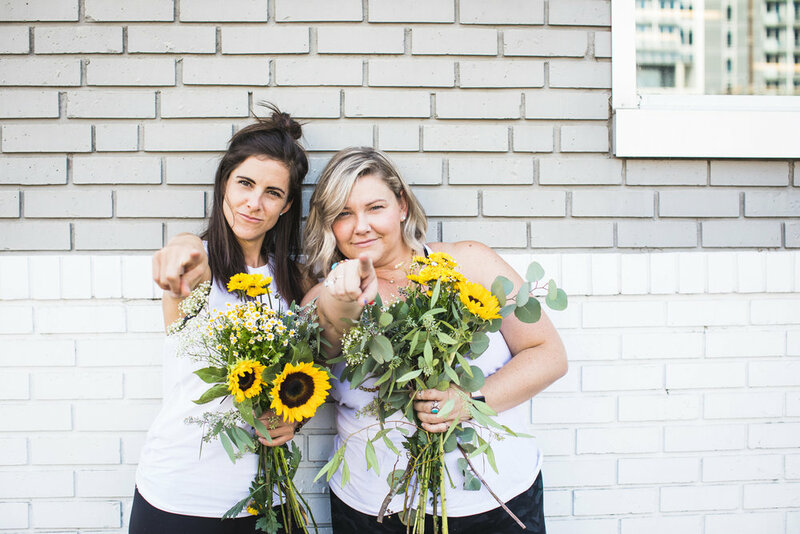 Please see our “Teachers" tab for any upcoming information sessions (and stay for a complimentary yoga class) or to access each of our yoga class schedules. 12. How will this training set me apart from other YTT graduates? Our training is committed to empowering you as a practicing yogi and as an overall person. We aim to support you in developing yourself as a teacher, continual student and member of your surrounding community. You will also have the skillset to teach to every type of body, mind and spirit. In a culture that often develops competent teachers for a mainstream setting, we are setting the bar higher by creating teachers who can work mindfully, intuitively, compassionately, inclusively and beyond. 13. What’s this whole “embrace, embody, empower” thing all about? “Embrace, Embody, Empower” Yoga Teacher Training firmly believes that yoga is available to all.. Our training accepts, recognizes and celebrates differences and abilities. We foster a teaching environment that is both connecting and empowering. Through alternative, mindful and instructional approaches, this platform develops teachers to guide wholesome and healthful yoga classes. Teachers will learn to provide students a safe and supportive space to self-explore, express and embrace their uniqueness in mind, body and spirit. 14. This all sounds OM-azing! How do I sign up? We think YOU're OM-azing! Please scroll to the bottom of this page and click on the "REGISTER HERE" tab. We are so excited and honored that you’re considering joining this incredible journey. We hope to connect with you very soon.